The Bruce County Historical Society was first organized in 1901 and was active until World War I. In 1957 the society was re-established. We publish a yearbook, Historical Notes, as well as a twice annual newsletter. We meet several times during the year, including for an annual bus tour in the spring and an annual dinner meeting in the fall. 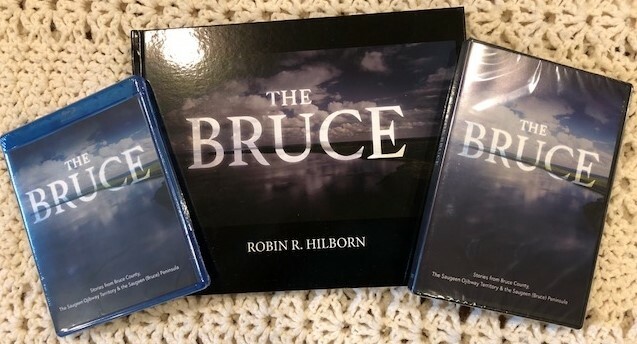 The society published its first book, The History of the County of Bruce by Norman Robertson, in 1906, and we continue to provide publications about Bruce County's history. The annual membership fee of $20 includes the yearbook and newsletter, and members receive a 10% discount on our publications. Our society's goals and objectives are to research, document, collect, preserve and edit material pertaining to the history of Bruce County and its people; to actively promote and encourage public awareness and interest in our local history; to publish new and reprint publications of significance to the history of Bruce County; to disseminate and arouse public interest in Bruce County historical and heritage information by organizing and featuring programmes and promoting discussion at regular meetings; to encourage the preservation and protection of buildings and structures of historical and architectural significance and the protection of our unique natural landscapes; and to mark historic sites, structures, trails, etc..
We are pleased to be able to now offer copies of ‘The Bruce’ DVD, Blu-ray and Companion Book available for sale. Postage is $5 for each DVD disc or Blu-ray disc and $17 for each book. If you purchase a book and a disc the postage is $17. Please contact us for postage costs for multiple copies. We accept cash, cheque, MasterCard, Visa and American Express. Please make cheques payable to the Bruce County Historical Society. Information about our projects, including the Bruce County Heritage Documentary Project, the Bruce County Military Project and the Bruce County Barn Project, can be accessed from our History page. We thank the Ontario Trillium Foundation for a grant received in 2012 to publish and distribute three history books that document the heritage of the county and its people. Copyright © 2002 - 2019 Bruce County Historical Society. All Rights Reserved.